Here's one of the past year's most unexpected and interesting reissues. We associate the "single" – usually a 7-inch record that spins at 45 rpm – with popular music, maybe Elvis or The Beatles. It is not a commonly known fact that several labels released classical music in this format as well. Initially, this was meant as a transitional format between 78-rpm and 33 rpm records, but it took on a life of its own, and persisted into the 1960s. 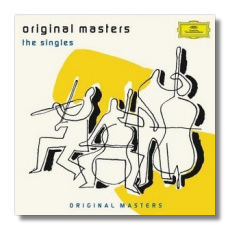 Deutsche Grammophon embraced the format, releasing over 1200 titles between 1953 and 1965. There were three types of singles on DG. Catalog numbers starting with "32" were most like pop singles – they were short, and the cover art, if any, was basic. The "30" series was for "EPs" or extended-play discs, capable of holding more than eight minutes of music per side. Here, the cover art and annotations were more involved. The third series was designated "37" and was reserved for DG's Archiv subdivision, which was devoted to music up to the time of and including Mozart. All three series had a retail cost well below that of regular LPs, and so DG's singles were popular as gifts and as musical postcards, if you will. Many of DG's singles featured well-loved repertoire – arias from operas and operetta, overtures, and light classical favorites. For the current reissue, DG wisely decided to focus on the more unusual items in its back catalogue. Thus, we have Shura Cherkassky playing Morton Gould's Boogie Woogie Etude, Andor Foldes playing Virgil Thomson's Ragtime Bass, Ferenc Fricsay conducting two orchestral works by Rolf Liebermann – Furioso and the Suite on Swiss Folksongs, and bass Kim Borg singing two versions (Beethoven's and Mussorgsky's) of the "Song of the Flea" from Goethe's Faust. (Imagine anyone but Feodor Chaliapin and Boris Christoff singing the latter!) For me, some of the highlights are the Koeckert Quartet's recording of Wolf's Italian Serenade, and Leopold Simoneau singing the best-known arias from Martha and L'elisir d'amore. DG even offers us some German-style cheese in the person of Helmut Zacharias (the father of classical pianist Christian Zacharias) who was Germany's most famous jazz violinist in the 1950s. Here, he plays and conducts charmingly soupy arrangements of Fritz Kreisler's Liebesfreud and Liebeslied. There's nothing here that is unenjoyable or unworthy of reissue. It's like attending a carnival. There's been a little cheating. It turns out that some of these recordings were never released as singles! (DG justifies their inclusion by arguing that they could have been released in that format.) It is more important to realize, however, that many of these recordings haven't been released on CD until now, so this reissue fills a whole bunch of niches. Although they were not in stereo, these were good sounding discs, and that holds true, if not more so, for these remasterings. (One exception: the Mozart EP is plagued with a sort of pulsing effect, which suggests a problem with the master tape.) The annotations are extremely thorough, and the inclusion of recording data will appeal to the "record nerd" in those of you who have gotten this far in my review! Cute, surprising, and stylish, DG's singles retain much of their viability in the year 2004. Would it be possible to compile a "Son of the Singles" sequel, DG? At least this collector would welcome it.